The Food, Family and Farming Tour at Lucky Penny Creamery in Kent will celebrate the small family farm, women in agriculture, and agricultural entrepreneurship. From 10am-5pm on Saturday, August 15, you can join four women in agriculture for an empowering day focused on raising dairy goats, making cheese, composting, and living the small farm dream. 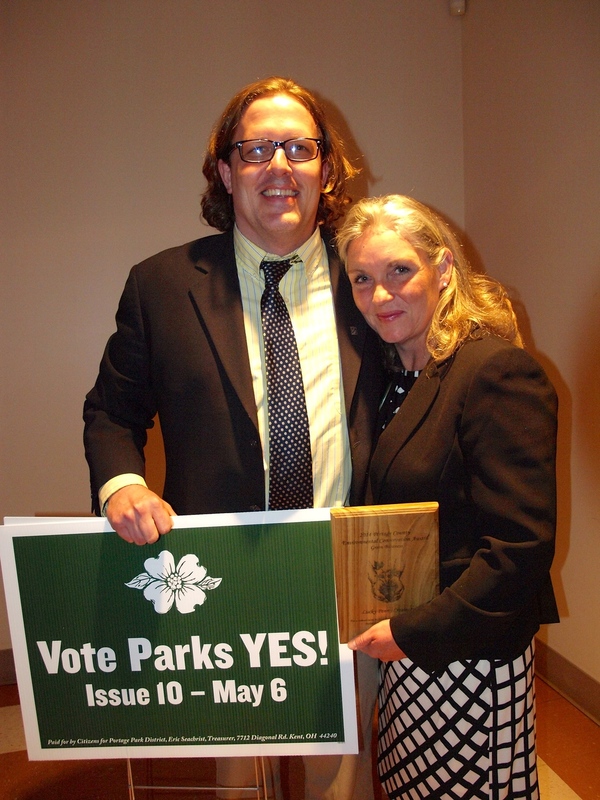 Thank you for the honor, Portage Park District Foundation! Come check out the new parking lot at the Creamery (632 Temple Avenue, Kent, Ohio)!Remember our retail business hours are Saturday 9-1. Hope to see you soon! The Ohio State University President Gordon Gee visits the creamery. Abbe received a visit from the President of The Ohio State University, Dr. Gordon Gee the other day. Abbe earned her masters degree from OSU. Thanks for the visit Dr. Gee! Abbe spoke with the Oberlin College Slow Food Chapter. She had a great visit. Check out the link for more information. Lucky Penny Farm in Garrettsville and Lucky Penny Creamery in Kent are special places where art, agriculture, food and family intersect. Although it exists for us as a family business and farm in rural Ohio, its just as much a state of mind dedicated to food, family, living simply and sustainably. Our goal is to use our hands for good work- in the kitchen, in the garden, in the studio, in the creamery and in our community. At Lucky Penny Farm we produce fresh, nutritious, delicious goat milk; at Lucky Penny Creamery we produce artisan cheeses and candies handcrafted in small batches. Help us promote the Lucky Penny mission by supporting local producers and chefs, community non profits and small agricultural businesses. Not only do you get to enjoy fresh, nutritious products but your dollar supports local families and businesses dedicated to improving the fabric of rural communities as well as providing something extra special for your family table. Sign up for our monthly e-newsletter by clicking on the "Subscribe" link immediately to the left of this text for ways to connect with other agricultural artisans, view simple recipes and talk small farms, goats and cheese. Next month we will have goat cheese, cajeta and goats milk soap available for sale at local stores and restaurants near you. Please ask for Lucky Penny Farm products by name, and if you think there is a special place we should be please let us know. We would be delighted to share our farm, cheese and candies with you. A penny for your thoughts...feel free to reach us and say "hello" through the contact link above. Thank you to everyone who packed the room to show support for Lucky Penny Creamery. It was great see see old friends, teachers, fellow business owners and 4-H er's who believe in family farms and sustainable food production. Lucky Penny Creamery now has a new home in Kent, Ohio and by fall we will produce goat cheeses and candies, handcrafted in small batches from Lucky Penny Farm's goat milk. Our operation located on Temple Ave. will be non-invasive, low impact, safe, environmentally sensitive and quiet. As a bonus, we believe the creamery will become a source of pride for the City of Kent as an example of local economic development and regional sustainability. Now its time to get down to work. We will be renovating the property on weekends throughout October. Let us know if you're good with a paint brush or trowel.